Steer clear of the cole slaw! That has always been my motto at summer barbecues. There is something about limp cabbage salads drenched in sun-warmed mayonnaise and permeated with the harsh taste of raw onions that makes me lose my appetite. However, when I made a Teriyaki Flank Steak Sandwich with Napa Cabbage, Red Peppers & Carrots a few weeks ago, I was reminded of the inherent crispness of Napa cabbage. With Asian flavors on the mind, I whisked together a dressing that included rice vinegar, lime juice, sesame oil, and ginger. And then came the kicker. A potent little chile that the food world likes to refer to as a serrano chile. I call it the devil’s pitchfork. Not remembering where serranos fell on the heat scale, I popped a tiny piece into my mouth – and then proceeded to latch my lips to the cold water spigot. Hence, the use of half a chile in this recipe…seeds and membranes removed! Despite my run-in with the serrano chile, this is possibly the best slaw I have ever eaten. Between the crispness of the cabbage and carrots, and the tangy and sweet dressing, this slaw will not be the last dish standing at your next potluck or barbecue. In a small bowl, whisk together 3 tablespoons rice vinegar, 2 teaspoons sugar, 1 teaspoon peeled and grated fresh ginger, 1 tablespoons sesame oil, 1 tablespoon canola oil, 1/2 teaspoon lime zest, 1 tablespoon fresh lime juice, and 1/2 finely chopped fresh serrano chile, with seeds and membranes removed. 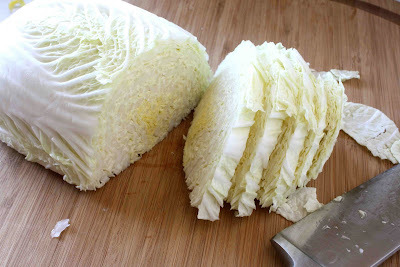 Cut a 1 1/2 pound Napa cabbage in half lengthwise, core it, and cut crosswise into 1/2-inch slices. 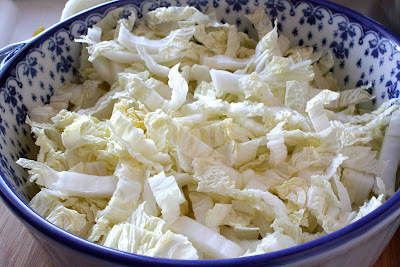 Separate the cabbage leaves into a large bowl. Add 1 1/2 cups grated carrots, 4 chopped scallions, and 1/2 cup chopped cilantro, and toss well. 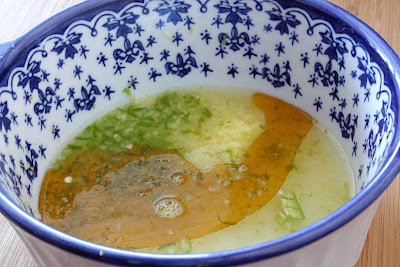 In a small bowl, whisk together rice vinegar, sugar, ginger, sesame oil, canola oil, lime zest, lime juice, and chile. Set aside. I love a light, crispy slaw. I'm filing this one away for this summer. I love the flecks of green and orange throughout the slaw. I think it would be hard for me to stay away from it. Mmmmm….looks colourful, healthy and delicious. I love it. Excellent slaw! I love the ginger and serrano chile here! I've been trying to learn to love cabbage – the Napa is much more flavorful and this dish does entice. This is a must-try refreshing, light and flavorful coleslaw. I absolutely love the photo. It's speaking to me. 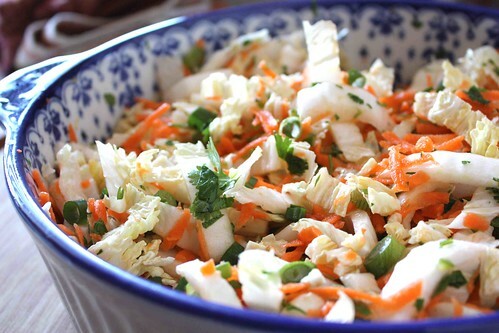 Asian slaw is my favorite way to eat cabbage. I make one with red pepper and cilantro. I will be trying yours next time! Oh yes, I love this already and I haven't even tasted it yet! I might have to cut down to 1/4 a chile though, since I'm such a lightweight. Megan – I did steer my kids clear of this one. I think next time I'll divide the slaw in half and top their portion with a serrano-free dressing. Jenn – I have been taking a bite of this each time I open the fridge. MaryMoh, 5 Star Foodie, Divina – Thank you! Claudia – I am not typically a big cabbage fan, but this is so crispy and flavorful that I can't resist it. Maria – The red pepper and cilantro combination sounds great, too. Kalyn – 1/4 chile would be just as good in here. Eating something that's too spicy for your palate is never enjoyable. I happen to have cabbage and carrots in the garden :). I think this is in my near future. Printing. This looks delicious! I can imagine the taste and will have to try this soon. Most excellent! It's hard to beat a perfectly made Asian slaw. Love your slaw. So much lighter and friendlier than the mayo slaws. And be careful with those serranos – if you're not ready, they'll kick you in the you-know-what! Now this is perfect for the start of spring I just love the colors with the heat in the recipe awesome! What a gorgeous slaw! The dressing with the spicy kick sounds excellent! This coleslaw sounds crisp and refreshing. Great recipe 🙂 I love slaw – especially Asian slaw! Cabbage is so great for you too! I love the flavors in your dressing, so nice. Poor you with the chile! I've done a similar thing where I forget I was chopping habaneros and then I touch my mouth or worse – my eye!!! Yikes. Hi Canuck, nice recipe for this napa cabbage. I always like to try something new besides stir fried. And this cold salad sounds great especially during this heaty & humid weather over here lately! It's been awhile since the changes made by FB. Still trying to catch up with all of you guys. All the best! I was craving asian slaw and decided on your recipe after perusing tastespotting. Your recipe turned out a delicious, light summer salad. I added ground chicken and cashews for protein and made a wonderful meal. Thanks for sharing your recipe! Carla, thanks so much for letting me know that you enjoyed this recipe. Adding ground chicken and cashews is a great idea – I'll have to try that. Excellent Asian slaw, made it for dinner this evening with Asian lettuce wraps! Everybody liked it! Gonna share this with my Foodie peeps! !